It's all about the love! 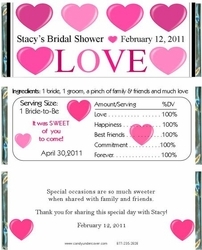 Our SPREAD THE LOVE CANDY WRAPPER design is a wonderful way to tell the world exactly how you feel. Perfect for Bridal Showers, Weddings and more. Chocolate is the SWEETEST favor and is sure to be a hit at your party!